Fuxiang Zhang. MD, Alan Sugar, MD. The Institutional Review Board of Henry Ford Health System approved a clinical trial. Seven retinal detachment cases have been evaluated in this single general ophthalmologist’s practice. 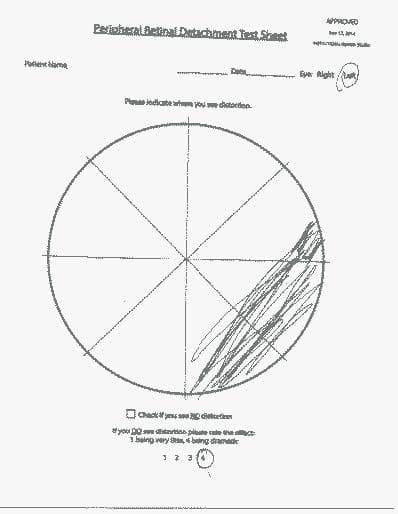 The first patient had a positive ring test in the affected eye but was excluded from this study because of the lack of written consent form. The remaining 6 patients signed a written consent form. 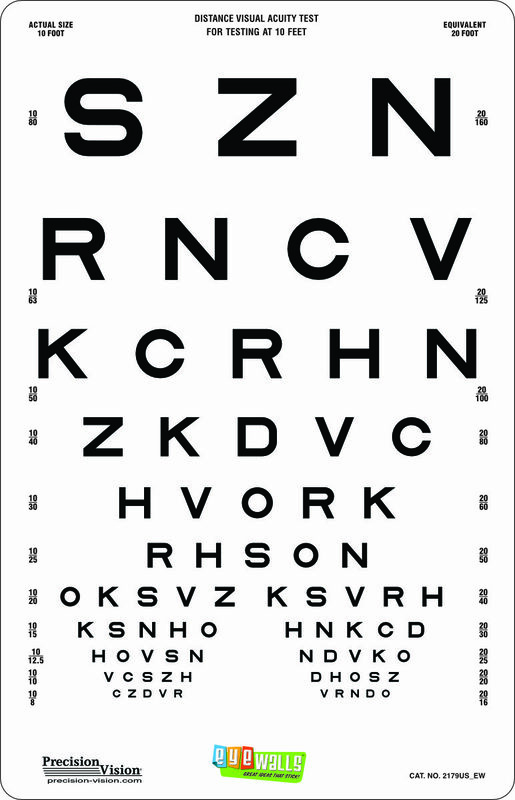 The poster was held at patient eye level about 7 inches away from the tip of the nose or 8 inches from the tested eye. All the tests were performed by the author (FZ) or his assistant in an ordinary illuminated examination room. The unaffected fellow eye was tested first while the affected eye was occluded. All the tests were done monocularly. The unaffected eye was used as the control eye. 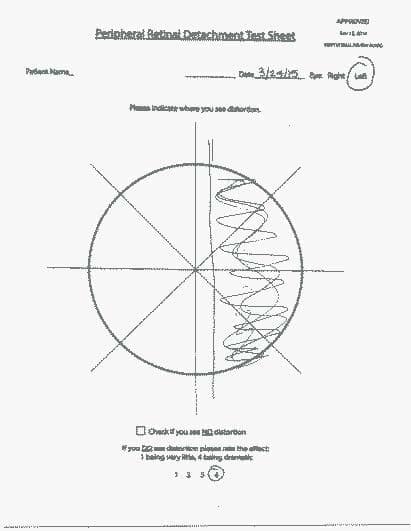 The patient was asked to fix monocularly on the central white dot without moving fixation and to perceive the peripheral ring. 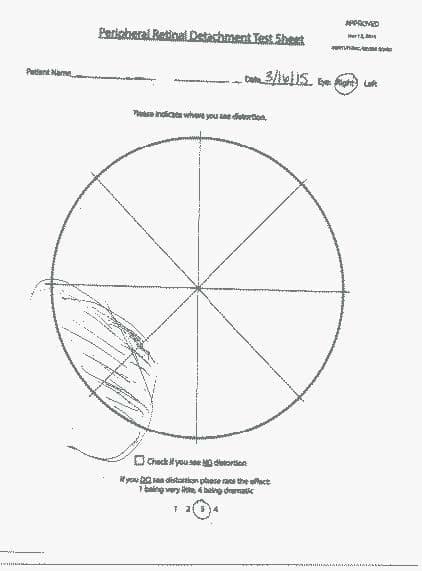 A data collection sheet (Figure 3) was used for each eye and each ring size. The patient was advised to first check if there was distortion or no distortion. If there were distortion, the patient would rate the severity on a scale of 1 to 4, 1 being the mildest and 4 being the most severe. 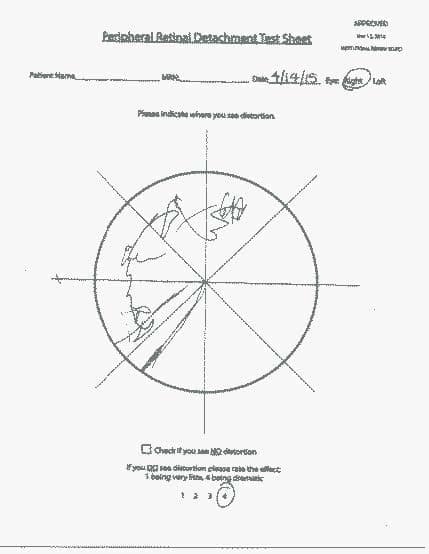 All 6 patients had fundus photography performed to document the retinal detachment. A 77-year-old female complained of a spot in the right eye for 1 day. Vision without correction was right eye 20/30 and left eye 20/25. Fundus exam showed a superior-temporal retinal detachment. 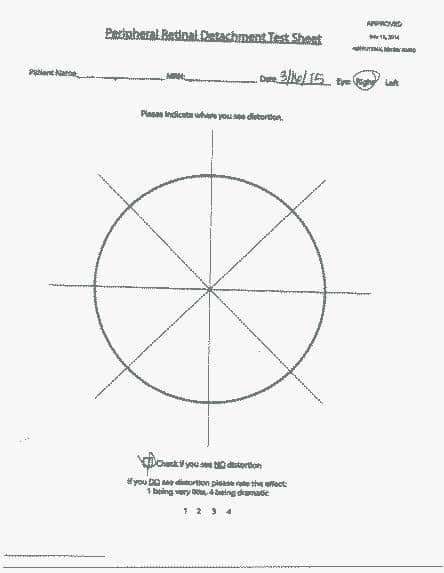 The patient did not see distortions on the small ring, but did see distortion on the large ring in the inferior nasal quadrant, rated at level 3 in severity. The ring test was negative for the left eye. Fundus photography showed a superior-temporal retinal detachment in the right eye. The patient was referred to a retinal specialist on the same day and had a pneumatic retinopexy performed in the right eye. 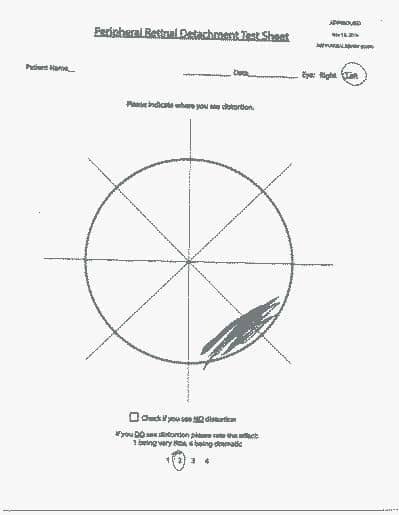 A 36-year-old male complained of a long-standing slight decrease in vision of his right eye. 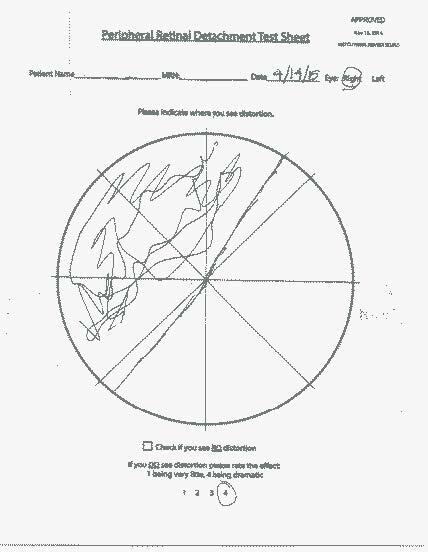 The patient was referred by an optometrist on March 17,2015. Vision with correction was right eye 20/30 and left eye 20/50. Fundus examination of right eye showed a chronic superior-temporal retinal detachment, which appeared to be old with a clear demarcation line. The patient saw distortions in the inferior-nasal quadrant of the right eye on both the small and large ring. Distortions were rated at severity of 1. Fundus photography also showed a chronic superior-temporal retinal detachment. The Ring test was negative in his left eye. The patient was seen by a retinal specialist the same day, and had a vitrectomy performed in the right eye. 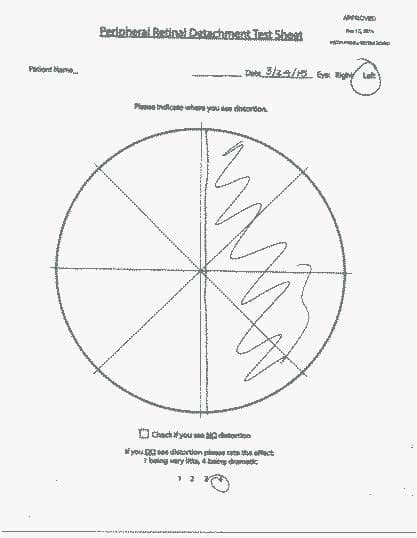 A 68-year-old female complained of left eye pressure and that her vision didn’t feel right for one day. 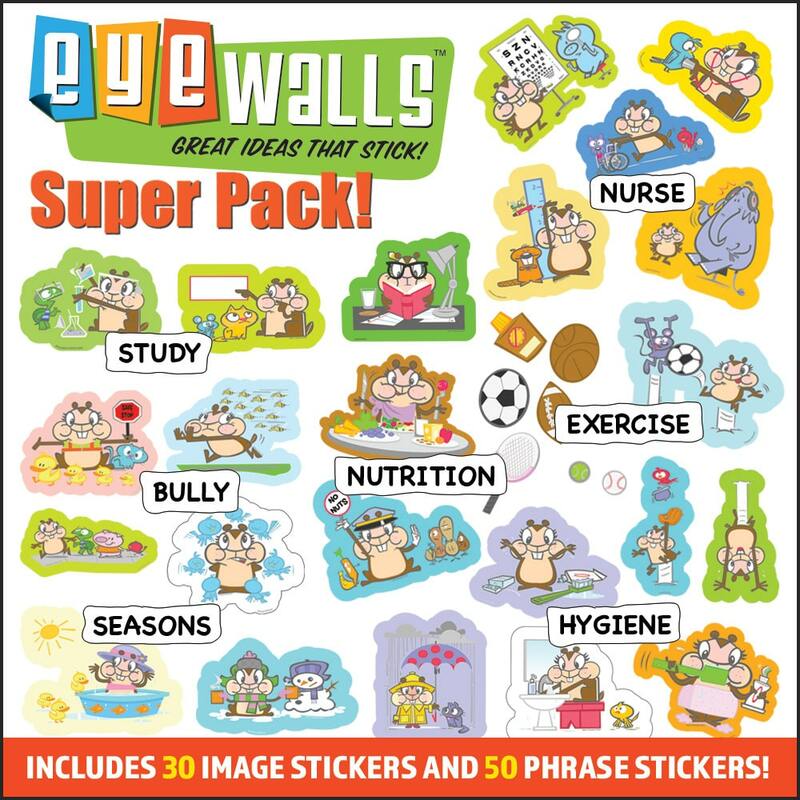 Vision with correction was right eye 20/20 and left eye 20/25. Fundus exam revealed a temporal retinal detachment with a horseshoe tear in the left eye. Ring tests showed severe distortion and a missing segment on the nasal side on both small and large rings. Distortions on both rings were rated at 4. The Ring test was negative in her right eye. Fundus photography showed a temporal retinal detachment in her left eye. The patient had a vitrectomy performed by a retinal specialist the following day. 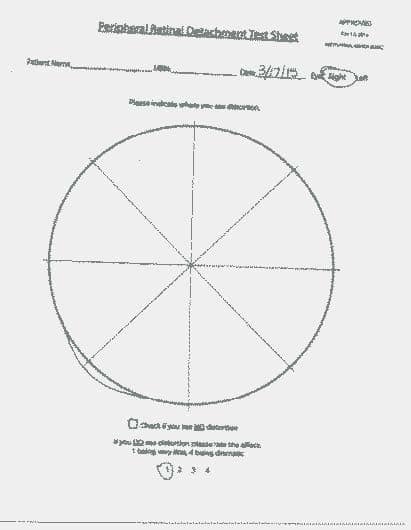 On her one-month postoperative follow up, The Ring test was repeated and the patient saw no distortions on the small or large ring. 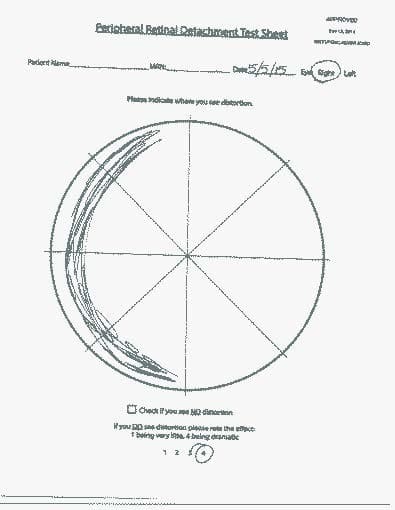 A 54-year-old male complained of fuzzy vision in the right eye at distance and near for 1 month. Vision with correction was 20/40 in each eye. Fundus examination showed a temporal elevated retinal detachment in the right eye. The patient saw distortions on both the small and the large rings on the nasal side. Distortions were rated at a severity of 4. The Ring test was negative in his left eye. Fundus photographs showed a temporal retinal detachment in his right eye. The patient had a scleral buckle procedure performed by a retinal specialist in his right eye. 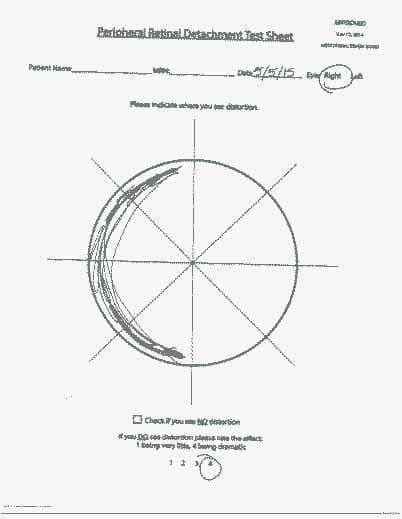 40-year-old female complained of a line through the vision of her right eye for 3 months. 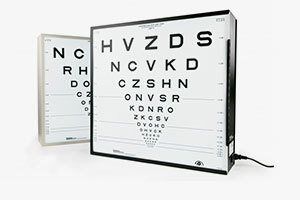 Vision without correction in the right eye was 20/200 and in the left eye 20/25. Fundus examination showed a superior temporal retinal detachment. The patient saw distortions on the small and large rings on the nasal side. Distortions were rated at level 4. The Ring test was negative in the left eye. Fundus photography showed a temporal retinal detachment in the right eye. Patient saw a retinal specialist the same day and had a vitrectomy performed with endolaser and C3F8. A 46-year-old female complained of a black spot in her vision in the left eye for 4 days. Vision with correction was 20/30 in each eye. Fundus examination revealed a superior temporal retinal detachment in the left eye. The patient saw distortions on the nasal side of both rings. She rated the severity in the small ring at 2 and in the large ring at 4. Fundus photographs showed a superior temporal retinal detachment in the left eye. The Ring test was negative in her right eye. She had a vitrectomy performed by a retinal specialist the next day. Retinal detachment is a potentially blinding disease. Early diagnosis and management is critical for visual recovery. Its incidence is about 6-7 per 100,0001-2 in the general population, but much higher in high-risk eyes with high myopia where the eyes are typically longer than average and retina is thinner than average, subject to retina tear and retina detachment. In high myopia, the long eyes are also often associated with high incidence of posterior vitreous detachment.3Morita Acute posterior vitreous detachment, peripheral retinal lattice degeneration, and a family history of retinal detachment are all considered as risk factors for retinal detachment. 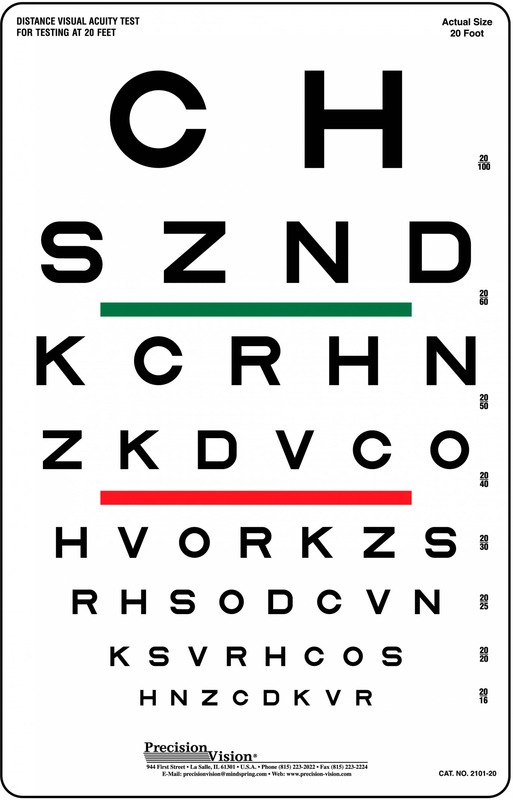 The Amsler grid was introduced as a home use tool in 1947 to monitor the central 20-degree macular integrity.4 This simple chart has helped millions of patients with macular diseases, especially age related macular degeneration (ARMD). 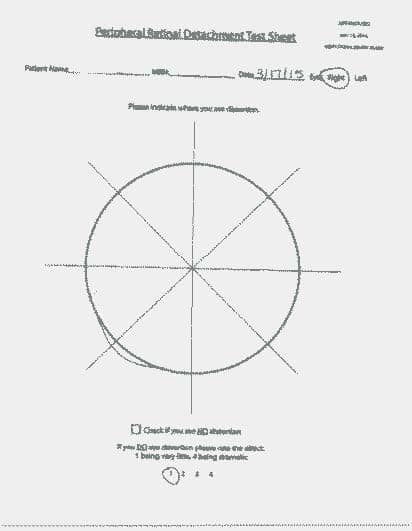 We do not know how many ARMD patients are brought to a doctor’s office because of this device, but it is not rare for clinicians to see such patients because they noticed changes on the Amsler grid. For acute rhegmatogenous retinal detachment, we really do not have any easy to use monitoring home used tool for patients or screening test for emergency medicine providers. There have been devices used clinically, including ultra wide-field cameras to image the peripheral retina, even in undilated eyes, but again they are office-based technology and typically for eye care providers only.5 The author is not aware of any device available for patient home use to monitor peripheral retina integrity or for emergency medicine providers for screening. Patients with a high risk of retinal detachment are often scared of this blinding disorder. Typically, they can do little except have a dilated retinal examination. The lack of a handy monitoring device alone may have a negative psychological impact. Such patients are traditionally advised to watch for increased floaters, flashes of light and a curtain like vision change, but the efficacy of this self-observation is yet to be determined. Three of the six cases in this small pilot study had a significant delay before seeing their eye doctor after they felt something happening to their eyes: case 2 “for a long time”, case 4 for one month and case 5 for three months. Some retinal detachments cause vision changes, such as those with an acute posterior vitreous detachment and or vitreous hemorrhage, but some may not have any central vision change. That may explain why there is variation of the length of delay prior to the office visit. For all 6 cases in this study, the fellow healthy eyes had no distortion at all but all of the affected eyes had positive distortion or missing segments on the ring test and the location of the abnormal segments matched the detached retinal anatomy in each eye. When the location of the detached retina is very peripheral, the small ring can be intact but the larger ring test can be positive, as in case 1. We cautiously recommend the big ring be used. The test is very simple and easy to use. The cost of the paper poster is minimal. The affected eye can be compared to the fellow good eye. This newly invented ring test showed promising evidence that it might be used as a home monitoring device for high risk patients of RD or as a screening test in emergent/urgent care setting for emergency care providers to promote early diagnosis and management of retinal detachment. Larger studies are needed to further confirm its validity, specificity and sensitivity. New options for retinal imaging. Review of Ophthalmology, May 2015, page 16-18. The authors wants to sincerely thank Henry Ford Health System Innovation Institute for it’s supporting in the development of this device. 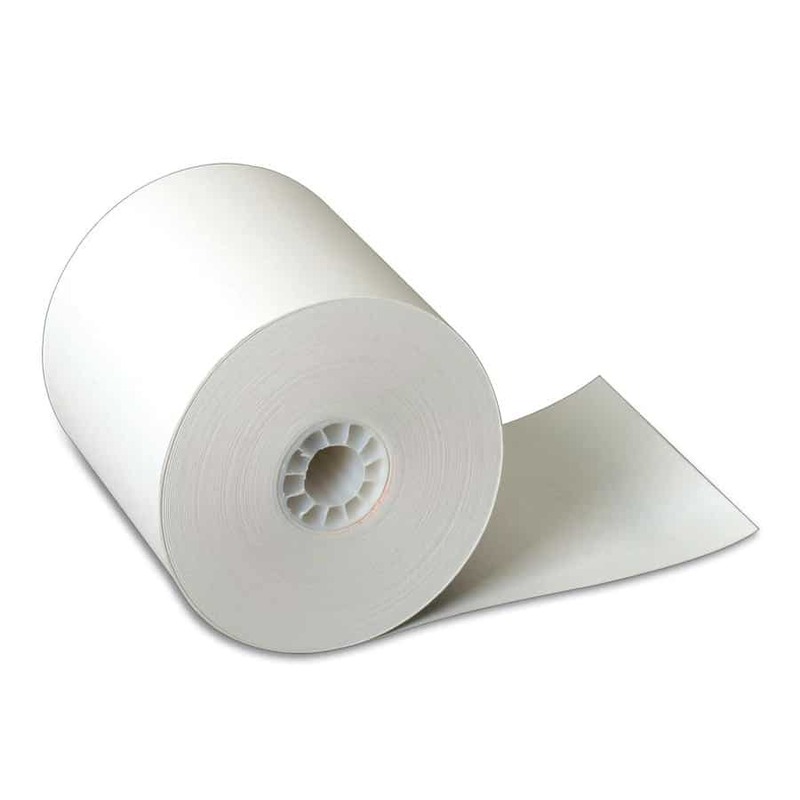 Previous post: Notice of Counterfeit Pelli-Robson Products. Don’t Be a Victim.